Star Wars Jedi Knight: Jedi Academy is a 2003 first- and third-person shooter action video game set in the Star Wars universe, and is the latest entry in the Star Wars: Jedi Knight game series. It was developed by Raven Software and published by LucasArts in North America and by Activision in all other territories worldwide. The game was released for Microsoft Windows and OS X (published by Aspyr) in September 2003 and for Xbox (developed by Vicarious Visions) in November 2003, and received positive reviews. Jedi Academy is powered by the Quake 3 engine, the same engine used by Jedi Academy's predecessor, Jedi Outcast. In a new feature to the series, the player can modify the character's gender and appearance, and can construct a lightsaber by choosing the hilt style and blade color. As a first and third-person shooter set in the Star Wars expanded universe, Jedi Academy puts the player into combat wielding a variety of firearms from that universe, as well as lightsabers and Force powers. The player can choose perspective for every weapon except for the lightsaber, which must be wielded in a third person view. The shooter aspects of the game are standard, including a variety of projectile and energy weapons and explosives. Players have a health meter and a shield meter, which are replenished separately. In both single-player and multiplayer, the player character is a Force-user, who has access to a variety of Force powers in addition to their lightsaber(s). Powers include Push, Pull, Jump, Heal, Lightning, and other abilities from the Star Wars universe. Force powers are categorized into core, Light (defensive) and Dark (offensive), and each Force power has three ranks, with the power increasing in effectiveness with each rank. In both single-player and multiplayer, players choose how to rank up their powers, adding a layer of customization. During gameplay, the player has a "Force meter" which is depleted when powers are used, and recharges when no powers are in use. Jedi Academy places a heavy emphasis on lightsaber combat. The player can create a custom lightsaber by selecting a hilt and one of five blade colors. Later in the game, the player can choose to wield a single saber, one saber in each hand, or a "saber staff" similar to the double ended lightsaber Darth Maul used in The Phantom Menace which also adds a kicking ability unavailable with any other lightsaber. The different sabers each have unique styles and special moves. When using a single saber, the player can choose between three stances which affect the speed and power of attacks; if using dual sabers, the player can switch off the second saber and use the "Fast"-style single-saber stance, or if using a saber staff, the player can switch the staff into a single-bladed saber that uses the "Medium"-style saber stance. The player initially chooses the character's species and gender, and begins the game with a single lightsaber. Midway through the game, the player can choose to use dual sabers or a saber staff if desired. The campaign alternates between linear plot driven missions and user-selected missions. For user-selected missions, the player is given a list of five missions, and chooses the order in which to complete them. The player is only required to complete four of the missions before advancing, although the option is available to complete all five. Between missions the player can choose one of their Force skills to upgrade. This will increase the impact of that Force power, so making the character more powerful as the game progresses. The game also introduces player-controllable vehicles and vehicle-based levels. A multiplayer game where a flag carrier redirects a rocket using the Force. In multiplayer mode, one can play online or via a local area network (LAN) with other players, as well as computer-controlled bots. The player can create their avatar using a series of options, similar to the character creation in single-player. Alternatively the player can choose to play as one of almost all of the characters from Jedi Outcast and Jedi Academy. Before a match begins, the server specifies the Force ranking to be used; this controls how many points the players have to invest in different Force powers. Players can then customize their powers for the match. The server can also disable normal weapons to create a lightsaber-only game. There are different multiplayer modes such as "Capture the flag", "Power Duel" and "Siege". Depending on the mode, players can play on their own or as part of a team. There are six multiplayer modes in total. The player takes the role of Jaden Korr (voiced by Philip Tanzini if male, and by Jennifer Hale if female). Jaden is a new student arriving at the Jedi Academy on Yavin IV, along with fellow student Rosh Penin (Jason Marsden). On their way to the Academy, the students' shuttle is shot down by an unknown enemy. As Jaden and Rosh make their way to the Academy on foot, they encounter two stormtroopers and a Dark Jedi, whom Jaden defeats. Jaden then sees a woman using a staff to drain energy from the Jedi Temple, but he is detected and knocked unconscious by the beam. Awakening, Jaden is met by Jedi Masters Kyle Katarn (Jeff Bennett) and Luke Skywalker (Bob Bergen), who both express concern about the incident. Jaden and Rosh become apprenticed to Kyle; however, in their first training session, Rosh's over-competitiveness endangers Jaden. Jaden is then dispatched on various peace-keeping missions across the galaxy. After completing several missions Jaden returns to the temple and overhears Rosh talking to another student, saying that he feels like the Jedi masters are trying to hold them back. Luke tells the assembled students that the Dark Jedi who attacked the Temple are members of a Sith cult called the Disciples of Ragnos. A member of the cult, a Twi'lek named Alora (Grey DeLisle), was able to infiltrate the Academy during the attack and stole Luke's journal. This allowed the cult to find numerous places strong with the Force and drain the energy there. The students are sent out to investigate the locations in Luke's journal. Jaden is sent to Hoth to investigate Echo Base, where he encounters Imperials and Alora. Jaden defeats her, and she flees. Returning to the Academy, Jaden finds that Rosh did not return from his mission to Byss. After completing several more missions, Jaden accompanies Kyle in an investigation of Darth Vader's fortress on Vjun. There, Jaden discovers that Rosh has joined the Disciples of Ragnos, having fallen to the dark side to avoid being killed. Jaden defeats Rosh (who is accompanied by two surviving Reborn Dark Jedi from Jedi Outcast) as Kyle arrives. At this point, the leader of the cult, who is revealed to be Tavion Axmis (Kath Soucie) arrives. She was the former apprentice of Kyle's nemesis Desann from Jedi Outcast. Tavion has recovered the "Scepter of Ragnos", which has the power to drain and release Force energy. Tavion disables Jaden and Kyle, causing the room to cave-in as she escapes with Rosh, destroying Jaden's lightsaber in the process. Kyle and Jaden narrowly escape and return to the Academy. Jaden is promoted to Jedi Knight, and constructs a new lightsaber. Luke comes to the conclusion that Tavion plans to restore the Sith to power by using the stolen Force energy to resurrect the ancient Sith Lord, Marka Ragnos (Peter Lurie). As the Jedi prepare to battle Tavion and her followers on Korriban, Kyle informs Jaden that he has received a call for help from Rosh. Though skeptical, Jaden agrees to help. Fighting through a mining facility on Taspir III, Jaden is again confronted by Alora, who continues to taunt him as he chases her through the complex. Eventually, Jaden finds Rosh, who asks for help and claims to have seen the error of his ways. Gripped by anger, Jaden is goaded by Alora to kill Rosh and join Tavion, while Kyle telepathically tries to dissuade him. At this point, the player can choose to either let him live and thus stay on the light side or kill Rosh and turn to the dark side. On the light path, Jaden spares Rosh and saves him from Alora, who cuts off Rosh's left arm. Jaden kills Alora and heads to the Tomb of Ragnos to confront Tavion, fighting his way through her followers alongside his fellow students. Jaden defeats her; however, she uses the scepter to invoke Ragnos's spirit, who possesses her body. Jaden defeats Ragnos and destroys the Scepter, banishing Ragnos' spirit back into its tomb and killing Tavion. Back at the Academy Jaden reunites with Rosh, who has recovered, and is honored by Luke, Kyle and the rest of the order. On the dark path, Jaden kills Rosh but refuses to join the Sith or help resurrect Marka Ragnos, instead killing Alora and heading to Korriban. Jaden leaves a trail of destruction behind him, killing Jedi and Sith alike before he confronts Tavion. Killing her, Jaden steals the Scepter only to be confronted by Kyle. Jaden defeats Kyle and escapes with the scepter. Kyle is rescued by Luke, and laments losing both Rosh and Jaden, vowing to hunt Jaden down. Luke wishes Kyle good luck, and notes that although Jaden has turned to the dark side, there is always hope and Jaden may not be beyond redemption. Jaden is then seen on the bridge of a Star Destroyer beginning a campaign of conquest. After Jedi Outcast was completed, LucasArts immediately approached Raven Software to develop a sequel. Production began and Raven was given a one-year development cycle. Like Jedi Outcast, Jedi Academy uses a heavily modified Quake III: Team Arena game engine, and the development team was made up of people who worked on Jedi Outcast, as well as Star Trek: Voyager – Elite Force. At the start of the game the player chooses the gender, race and clothing of their character. An early decision made during development was whether or not to have Kyle Katarn as the playable character. This was due to the character already being a powerful Jedi Knight, and, as such, starting off with the Force skills would affect the gameplay. To resolve this issue, Raven chose to make the playable character a student in the Jedi Academy. By using a completely new character, the developers were able to insert features that allowed the player to customize the character, including race and gender, as well as the lightsaber color, hilt, and type. The Kyle Katarn character was then made an instructor in the academy so as to remain integral to the plot, to ensure Jedi Academy built upon the existing Jedi Knight series storyline. Raven extended the customization further as the game progresses by allowing the player to choose specific Force powers to train upon completion of missions. This was done with the intention of giving freedom to choose the way and style the game is played. Another decision made early on was to include locations and aspects from the Star Wars movies. The designers wanted to use locations such as Tatooine (seen in The Prequel Trilogy, A New Hope and Return of the Jedi) and Hoth (seen in The Empire Strikes Back), as well as the Rancor creature. To develop the map for Hoth, the designers obtained as much source material from The Empire Strikes Back as possible so to create an authentic reproduction. Level Designer Justin Negrete says that Hoth was one of the most challenging areas to design. The general level design process started by planning out the level on paper. These ideas were then "fleshed out" to get the size and flow of the level. Once this had been done, features of the Quake III engine were used to add more detail such as lighting effects. The final stage of level design was adding aspects that improved the gameplay and fun of the level. The mission based format of Jedi Academy was used by Raven to reduce the linearity of the game, allowing the player to progress through levels mostly in the order they desire. The reduction in linearity was also achieved by requiring 80% of levels to be completed before the plot can move on. Raven provided modding tools with Jedi Academy, but the company specified that such tools are unsupported by customer support, so to avoid receiving calls on the subject. Brett Tosti, a producer for LucasArts, stated that the customization of the player that is provided by the game out of the box will mean that people are less likely to need to create their own "skins". The game was published and distributed within North America by LucasArts. Activision took control of publishing and distributing the game in all other territories worldwide. The game was released for Microsoft Windows and OS X (published by Aspyr) on September 17, 2003 and for Xbox (developed by Vicarious Visions) in November 2003, and received positive reviews. In September 2009, the game was re-released with the other Star Wars: Jedi Knight games (Star Wars: Dark Forces, Star Wars Jedi Knight: Dark Forces II, Star Wars Jedi Knight: Mysteries of the Sith and Star Wars Jedi Knight II: Jedi Outcast) through the digital distributor Steam and Direct2Drive. On January 29th, 2019, Major Nelson announced that Jedi Academy would be released on February 16th, as part of Xbox's Games with Gold program. Following Disney's decision to close LucasArts on April 3, 2013, the developers at Raven Software released the source code for the game on SourceForge under GNU GPLv2 licensing. A few days after release, the source code disappeared from SourceForge without explanation. SourceForge later explained to media outlet Kotaku that Raven Software had requested its removal. Kotaku speculated this was due to the presence of licensed code, such as for the Bink Video format from Rad Game Tools, that was not intended to be made public. Based on the source release from Raven, Jedi Academy is maintained by the JACoders group as OpenJK. Both the PC and Xbox versions of the game were well received. The PC version holds an aggregate score of 81 out of 100 on Metacritic, based on thirty-five reviews, and 80.18% on GameRankings, based on fifty-one reviews. The Xbox version holds aggregate scores of 76 out of 100 on Metacritic, based on thirty reviews, and 75.22% on GameRankings, based on forty-five reviews. Positive reviews praised the fact that, unlike in Dark Forces II and Jedi Outcast, players could use a lightsaber from the beginning. Game Over Online scored the game 92% and commented that "You start instantly with your lightsaber, rather than wading through six painfully bland FPS levels to get your lightsaber as you did in Jedi Outcast". Critics lauded the lightsaber interface and player customization options. Ernie Halal of Gaming Age gave the game an A-, writing, "You choose not only the gender and race of your character, but also which powers and fighting styles to develop [...] Third person adventure games rarely offer that much customization." Critics noted that, despite its age, the Quake III engine was used well. PC Gamer UK, who scored the game 70 out of 100, wrote "the engine, which although hardly groundbreaking any more, perfectly evokes the glow of the lightsaber and the grimy, metallic backgrounds of the films." Some critics did, however, note that the engine was starting to look dated. The multiplayer, in particular the objective-based Siege mode, was well received. The music, sound effects, and voice acting also received acclaim, although some critics found it odd that all aliens spoke English. The story and level design received mixed reactions. Some critics commended the levels as varied (both in terms of length and content). GameZone scored the game 9 out of 10, writing "Some are a fast blast that can be beat in ten or so minutes. Others [...] can take as long as hours [...] The change of pace is very refreshing." The story was described as "great" by GameZone and as "strong" by Gaming Age. IGN's Steve Butts, however, disliked the plot, feeling that "Jedi Outcast was more satisfying in terms of involvement with the story. Jedi Academy dishes out more action sooner but fails to put it in as solid a context as the previous game." Game Over Online was critical of the mission structure, writing "This kind of free-form mission assignment [...] only serves to weaken the plotline. It also leads to a disjointedness to the missions [...] it seems more like roaming than any actual story advancement." GameSpot's Craig Beers, however, praised the mission structure; "Jedi Academy does an excellent job of balancing its missions." IGN also defended the system; "It's nice that the game offers a series of fairly short, relatively unconnected missions at the start. It's a great way to get your feet wet and ease you in to the environments and the saber fighting before the challenge level ramps up." The AI was criticized by PC Gamer UK as "laughable"; "Every encounter you have is filled with people too stupid to realise that running away or taking some sort of cover would be the best option. [Jedi Academy] requires little to no skill to play through." This opinion was echoed by GameSpot: "Stormtroopers usually just stand there shooting away at you [...] Dark Jedi rush at you, even after watching four of their brethren plummet to a horrible death. Occasionally, you'll see an enemy accidentally commit suicide by falling off a cliff or falling into lava, enemies will not even dive for cover or try and throw it back if you throw an uncooked thermal detonator at them." Despite his criticism of the AI, GameSpot's Craig Beers scored the game 8.4 out of 10, writing "It manages to take all the fun parts from its predecessor and greatly expands them to create an engaging, new action game in its own right." IGN's Steve Butts scored the game 8.8 out of 10, giving it an "Editor's Choice Award" and writing "If you like Star Wars and think flipping around chopping up Stormtroopers and flinging Dark Jedi off of conveniently placed precipices is fun, then this game is definitely for you." Eurogamer's Kristan Reed was less impressed, scoring the game 7 out of 10, writing "The harsh reality is, for all the plentiful additions, there's much work to be done before LucasArts can boast it has created the ultimate Star Wars FPS. Sure, it's the best one yet, but with some often laughable AI and creaking tech underpinning it, the flaws are there for all to see." Kevin Gifford of 1UP.com scored the Xbox version a B-. He lauded the addition of Xbox Live support and the ability to use a lightsaber from the opening, two of biggest criticisms of Jedi Outcast. However, he called the graphics "worryingly out of date by current Xbox standards", saying that when playing in first-person mode "the game looks more like a two-year-old PC shooter than a modern Star Wars game." He concluded that "The Xbox Live games make Jedi Academy worth at least a rental to online players, but otherwise, this game's worth it to Star Wars fans only." Eurogamer's Kristan Reed was also somewhat unimpressed, scoring the game 6 out of 10 and criticizing the controls; "In common with the PC version, you still find yourself going into battle and fumbling furiously through cyclical menus while numerous baddies are busy blasting seven shades out of you." She was also critical of the AI and the graphics, concluding that "It's good to see Live make the package this time around, but we're disappointed that after all these years LucasArts is still scratching around abusing the Star Wars brand in this way. There are some good ideas here that haven't been realised, and we're once again left waiting for the definitive Star Wars FPS to appear." IGN were more impressed, scoring the game 8 out of 10. Although they were critical of the graphics and frame rate, and found the game to be inferior to Jedi Outcast, reviewer Steve Butts concluded "For the 15 or so hours that it lasted, I enjoyed Jedi Academy." GameSpot's Craig Beers scored the game 8.1 out of 10. He praised the mapping of the PC version's controls to the Xbox Controller and the implementation of Xbox Live, but like IGN, he was critical of the frame rates. He concluded that "The game may not look great, but it translates well to the Xbox--for those who would prefer to play it on a console. It even caters to those who aren't familiar with the Star Wars universe and just want pure action. In general, Jedi Knight: Jedi Academy is highly recommendable." GameZone's Nick Valentino scored the game 8.2 out of 10 and was especially impressed with the use of Xbox live; "the biggest draw--and the one that has me playing this one very often--is the fact that the multiplayer modes can also be played online using the Xbox Live service. That's right, you read it correctly. You can duel against other Xbox gamers out there using any of the seven multiplayer modes and even talk trash using your Xbox Communicator. Here's your chance to see if you're truly good with the lightsaber." ^ Vicarious Visions developed the Xbox version. ^ Aspyr published the Mac OS X version. ^ a b "Star Wars Jedi Knight: Jedi Academy (PC) Release Summary". GameSpot. Archived from the original on July 30, 2012. Retrieved August 20, 2013. ^ "Star Wars Jedi Knight: Jedi Academy (Mac)". GameSpot. Archived from the original on July 30, 2012. Retrieved August 20, 2013. ^ "Star Wars Jedi Knight: Jedi Academy (Xbox)". Eurogamer. Retrieved October 20, 2013. ^ "Star Wars Jedi Knight: Jedi Academy (Xbox)". GameSpy. Retrieved October 20, 2013. ^ Ham, Tom (September 21, 2003). "The Bat 2.0; Star Wars Jedi Knight: Jedi Academy; Cabela's Deer Hunt: 2004 Season". The Washington Post. Retrieved November 24, 2008. ^ "Jedi Academy Can't Feel the Force". Wired.com. November 26, 2003. Retrieved November 14, 2008. ^ a b Bevins, Tal (May 15, 2003). "E3 2003: Star Wars Jedi Knight: Jedi Academy". IGN. Retrieved April 29, 2008. ^ Miles, Stuart (December 16, 2003). "Star Wars Jedi Knight: Jedi Academy - PC. Full Review". Pocket-Lint.co.uk. Retrieved November 24, 2008. ^ Baker, Eric T. (October 27, 2003). "Star Wars Jedi Knight: Jedi Academy". scifi.com. Archived from the original on March 4, 2009. Retrieved August 19, 2013. ^ "Star Wars Jedi Knight: Jedi Academy". Xbox.com. Archived from the original on August 4, 2008. Retrieved December 6, 2008. ^ Morrison, Bruce (August 29, 2003). "Same Ole' Game, Brand New Title". thetigernews.com. Archived from the original on September 29, 2013. Retrieved September 29, 2013. ^ a b c d e f Beers, Craig (September 15, 2003). "Star Wars Jedi Knight: Jedi Academy PC review". GameSpot. Retrieved April 30, 2017. ^ Raven Software (2003). Star Wars Jedi Knight: Jedi Academy. LucasArts. ^ a b c d "Star Wars Jedi Knight: Jedi Academy Designer Diary #1". GameSpot. August 25, 2003. Retrieved April 30, 2017. ^ Sulic, Ivan (March 30, 2003). "Jedi Knight III Preview". IGN. Retrieved April 26, 2008. ^ a b "Jedi Knight: Jedi Academy Developer Interview". GameSpot. August 5, 2003. Archived from the original (WMV) on January 23, 2013. Retrieved April 29, 2008. ^ "Star Wars Jedi Knight: Jedi Academy Designer Diary #2". GameSpot. September 4, 2003. Retrieved April 30, 2017. ^ "Star Wars Jedi Knight: Jedi Academy Designer Diary #3". GameSpot. September 12, 2003. Retrieved April 30, 2017. ^ Keller, Matt (April 3, 2003). "LucasArts announce Jedi Knight: Jedi Academy". palgn.com.au. Archived from the original on December 23, 2008. Retrieved September 14, 2011. ^ Bailey, Kat (September 16, 2009). "Jedi Knight Collection Now Available On Steam". 1UP.com. Retrieved August 18, 2013. ^ "Star Wars Jedi Knight Collection". Steam. Retrieved August 16, 2013. ^ "Xbox Live Games With Gold For February 2019". Retrieved January 29, 2019. ^ "Jedi Academy Source Code". SourceForge. Archived from the original on April 7, 2013. Retrieved June 18, 2016. ^ Plunkett, Luke (April 3, 2013). "Lucasarts' Closure Convinces Developers To Release Awesome Star Wars Source Code". Kotaku. Retrieved April 4, 2013. In the wake of LucasArts' closure today, Raven - the developers of the thoroughly excellent Jedi Outcast - have decided to release the source code for the game. Oh, and the code for its sequel, Jedi Academy, as well. ^ Booker, Logan (April 13, 2013). "Just Like That, Jedi Knight Code Has Been Removed From SourceForge". Kotaku. Retrieved August 19, 2013. ^ "Community effort to maintain and improve Jedi Academy + Jedi Outcast released by Raven Software". GitHub. Retrieved June 16, 2017. ^ a b "Star Wars Jedi Knight: Jedi Academy for PC". GameRankings. Retrieved August 19, 2013. ^ a b "Star Wars Jedi Knight: Jedi Academy for Xbox". GameRankings. Retrieved August 19, 2013. ^ a b "Star Wars Jedi Knight: Jedi Academy (PC)". Metacritic. Retrieved August 19, 2013. 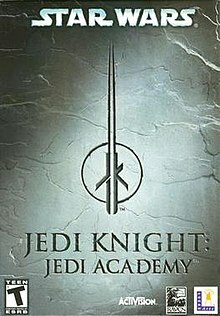 ^ a b "Star Wars Jedi Knight: Jedi Academy (Xbox)". Metacritic. Retrieved August 19, 2013. ^ a b Gifford, Kevin (January 1, 2004). "Star Wars Jedi Knight: Jedi Academy Xbox review". 1UP.com. Archived from the original on July 11, 2012. Retrieved November 19, 2014. ^ a b Reed, Kristan (October 2, 2003). "Star Wars Jedi Knight: Jedi Academy PC review". Eurogamer. Retrieved August 19, 2013. ^ a b Reed, Kristan (December 16, 2003). "Star Wars Jedi Knight: Jedi Academy Xbox review". Eurogamer. Retrieved August 19, 2013. ^ a b c "Star Wars Jedi Knight: Jedi Academy (PC) Reviews". GameRankings. Retrieved September 5, 2013. ^ a b c d "Star Wars Jedi Knight: Jedi Academy (Xbox) Reviews". GameRankings. Retrieved September 5, 2013. ^ a b Beers, Craig (November 20, 2003). "Star Wars Jedi Knight: Jedi Academy Xbox review". GameSpot. Retrieved April 30, 2017. ^ a b c d e Rgerbino (September 23, 2003). "Jedi Academy PC review". GameZone. Archived from the original on April 8, 2008. Retrieved April 26, 2008. ^ a b c d Valentino, Nick (November 28, 2003). "Jedi Academy Xbox review". GameZone. Archived from the original on March 31, 2008. Retrieved April 26, 2008. ^ a b c d e f g Butts, Steve (September 15, 2003). "Star Wars Jedi Knight: Jedi Academy PC Review". IGN. Retrieved April 26, 2008. ^ a b Butts, Steve (November 19, 2003). "Star Wars Jedi Knight: Jedi Academy Xbox review". IGN. Retrieved August 19, 2013. ^ a b c d Pearson, Craig (October 2003). "Star Wars Jedi Knight: Jedi Academy review". PC Gamer UK. pp. 88–90. ^ a b c Rorschach (September 26, 2003). "Jedi Academy PC review". Game Over Online. Retrieved April 26, 2008. ^ a b c d Halal, Ernie (September 17, 2003). "Jedi Academy PC review". Gaming Age. Archived from the original on October 10, 2011. Retrieved August 19, 2013.